Simply Jews: Chief Mufti of Russia and Putin's sense of humor. A joke or not a joke? Chief Mufti of Russia and Putin's sense of humor. A joke or not a joke? The colorful fellow in the picture is Talgat Tadzhuddin, Chief Mufti of Russia. In spite of the heavy burden of his post, the Mufti has time for inventing colorful jokes that might be too confusing even for a Russian leader's press-secretary, a pretty unassailable character. A spokesman for the Russian president, Dmitry Peskov, did not understand what the Chief Mufti of Russia Talgat Tadzhuddin meant, speaking about his proposal to Putin to deal with Israel and Syria as with Crimea. "I can't comment on it, to be honest, I just did not understand what was meant," said Peskov. "Apparently, we are talking about some kind of a joke Mufti made. It can't be anything but a joke," - he added. 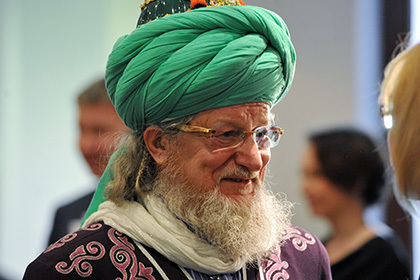 On Saturday, November 21, at the World Qoroltai of the Bashkirs in Ufa, the Supreme Mufti of Russia said: "On the Day of National Unity, after the representatives of traditional religions laid flowers and congratulated Vladimir Vladimirovich, I addressed him: Vladimir Vladimirovich, perhaps we should proceed with Syria and Israel like with Crimea? "said Tadzhuddin. Putin laughed and replied,"Mufti-Hazrat, we'll think about it." "There is no need to think, it is necessary to take [them] over. Let Russia extend down to Mecca. It is the will of Allah for people to live together in peace, love and harmony, "- said the mufti. The audience responded to his words with laughter and applause. Chief Mufti of Russia, Chairman of the Central Spiritual Board of Muslims Talgat Tadzhuddin, said in an interview that fasting people are not afraid of sanctions. "When a person fasts all his life, he doesn't care about any sanctions. He is ready for anything, "- said the Mufti. Tajuddin said that many people were angered by the curbs on the imports. "Some cry because of the sanctions imposed against us, because we'll not have bananas, because our menu will be limited. We lived a thousand years without bananas, thank God. We will not have them, but the monkeys of Africa will have more," he added. How did you sleep this night, Mr Erdogan? The Israeli Museum: Night over Germany. Do you still hope for Israeli/Palestinian peace?